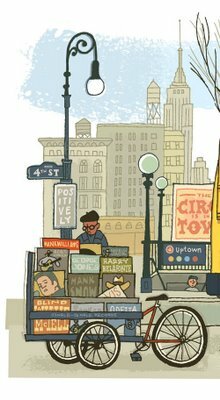 The picture book opens to a cartoon image of Bob Dylan holding up a little placard that says “Dig Yourself.” Thus, the ‘chill’ ‘hippie’ ‘sixties’ ‘indie’ vibe has been established ingeniously by the illustrator Paul Rogers from page one. 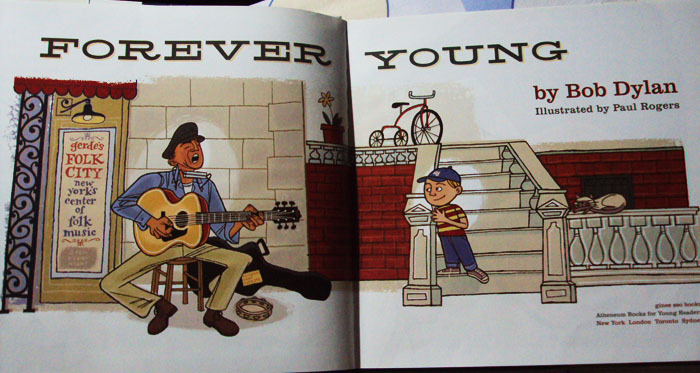 We began our Picture Books that Sing series with Joni Mitchell’s Chelsea Morning, I believe that the equally iconic Bob Dylan’s Forever Young would be a perfect end to our GatheringBooks Special for the month of September. 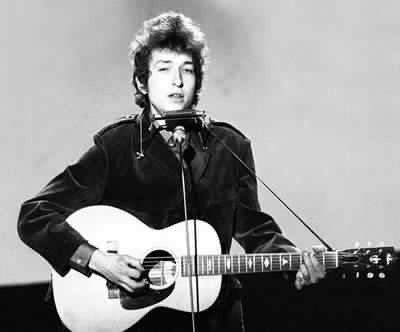 As I was reading through Bob Dylan’s biography – one very visible thing that struck me (aside from noting his multiple talents: he plays the guitar, keyboards, harmonica, and yes he paints too and does exhibits in museums) is that the critics can not seem to decide whether to love him or hate him. Yes, his being a recipient of countless awards including being inducted into the Rock and Roll Hall of Fame, Songwriters Hall of Fame and even a special citation from the Pulitzer Prize jury in 2008 for his indelible mark on American music – is a testament to the very clear recognition of his talents and skills. However, his vocal style has also been described as a “one-dimensional growl with which he chews up, mangles and spits out the greatest lyrics ever written so that they are effectively unrecognizable” (Mc Cormick, 2009)* What fascinates me though is his being a supposed-reluctant posterboy during the flower power period, and most of his songs during this period characterized as “protest music.” My current research interest is looking into the power of music to forge a sense of nationhood and to create a strong sense of national identity through song (particularly in Filipino music) – hence, my fascination with Dylan’s work. 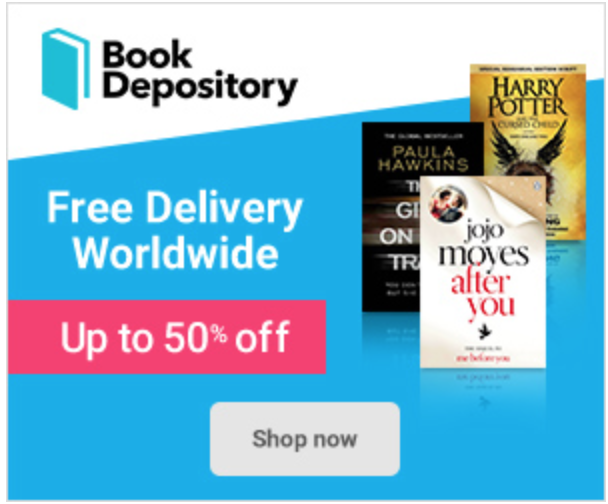 BUT, I would not even attempt to characterize the legend that is Bob Dylan in our pages since I am afraid that I might not do him justice, nor his music, so let’s stick to the book, I have digressed considerably, I apologize. The academic in me just couldn’t resist. The last two pages are filled with Illustrator Notes that explain in meticulous detail what some of the images mean – very useful for the unschooled such as myself. 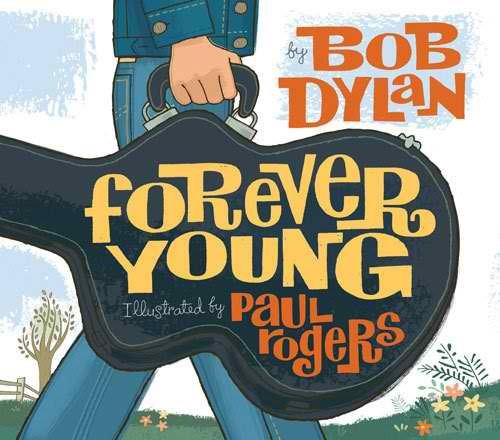 It does help that the equally talented illustrator Paul Rogers is a Dylan fan and has studied his life extensively. 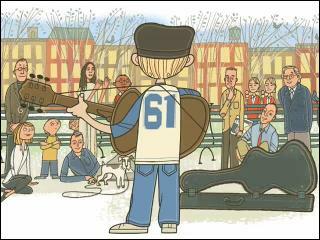 Hence, the drawings are even more meaningful in the sense that it includes snapshots of places that are significant in Dylan’s development as a musician – including Café Wha, the very first place where Dylan performed upon arriving in New York, the New York Public Library which Dylan frequents, Greenwich Village, Washington Square Park to name a few. 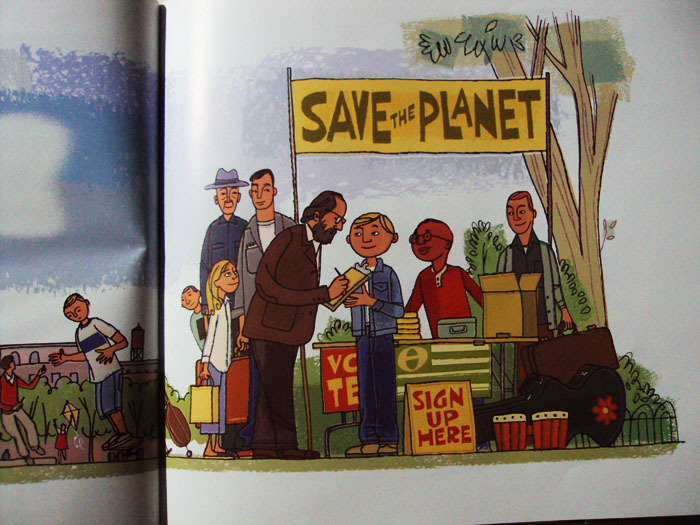 To say that Rogers did an enormous amount of work in this picture book would be a classic understatement. Each page is bursting with details that beg to be overanalyzed and linked to Dylan’s history and music. Click here to know more about Paul Rogers and his work. Each page of the book contains one or two lines from Dylan’s classic song. The timeless message of “May God bless and keep you always… may your wishes all come true” from the song are all found here. What made the music come even more alive is the way that Paul Rogers interpreted it through the visual storytelling of a boy avidly listening to his idol perform in Gerde’s Folk City, New York’s Center of Folk Music, receiving the idol’s guitar, subsequently inspiring him to create music and to touch the lives and hearts of others through song. I have of course taken a peek into Paul Rogers blog where he discussed certain elements of his visual storytelling through his artwork. Apparently, this act of handing over the guitar is similar to the proverbial ‘passing the torch’ which is likewise reminiscent of Dylan’s history as explained by Rogers in his Notes: “Johnny Cash gave Dylan his guitar when the two met at the Newport Folk Festival in 1963.” One could also link it to Dylan’s adulation of Woody Guthrie whose work has influenced Dylan’s music immeasurably. 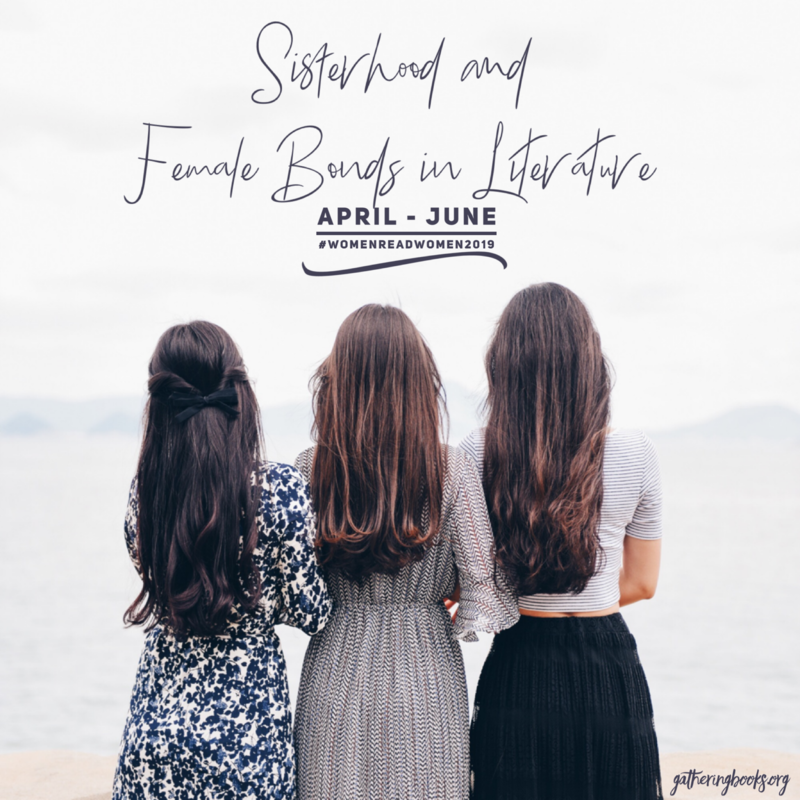 While your young boy or girl would no doubt be fascinated by the colorful illustrations, the hippie Mom or Dad would spend around two hours or so trying to figure out who’s who in the book pages. This one, for example, has Martin Luther King, Joan Baez, Albert Einstein, Ringo Starr, and Paul McCartney carrying the logo “Stop the War!” “Peace Now!” and “No More War.” If Mom (or dad) is in a lecturing mode, this could be a teachable moment where one could talk about the Beatles, introduce Joan Baez, and clarify that Martin Luther King is not the new member of Glee this season but some important historical figure who was part of the “times, they are a changin’” as Dylan himself crooned (or spat out from his mouth depending on whose view you are taking). The visual tale ends the same way the book begins with the young boy, now a full-grown man (we are assuming of course that this is Dylan himself) passing the torch (the guitar, that is) to a bright-eyed young girl. This picture book while a fairly short read, never fails to inspire and affirm, urging one to celebrate the color of one’s soul – or chakra, essence, universal-mother-earth energy. This rootedness to one’s core while building “a ladder to the stars” and climbing “on every rung” is what makes us perpetually young. Surprisingly, I am unable to find any youtube video of Bob Dylan singing this song live. There is this promotional video that the publishers have created which I find to be really cute though. 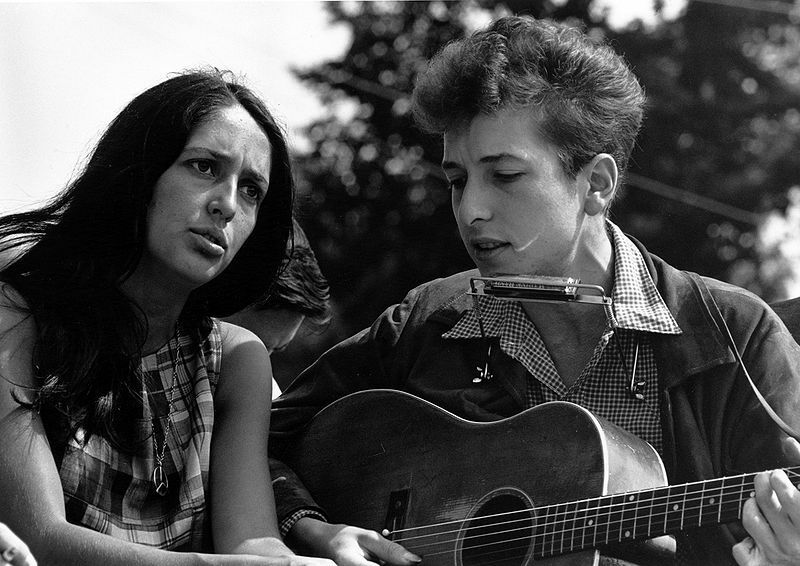 However, to remain true to Dylan’s limitless spirit, I give you Joan Baez doing a soul-touching rendition of Bob Dylan’s Forever Young. To peace, looove, and eternal youth. Rock On. 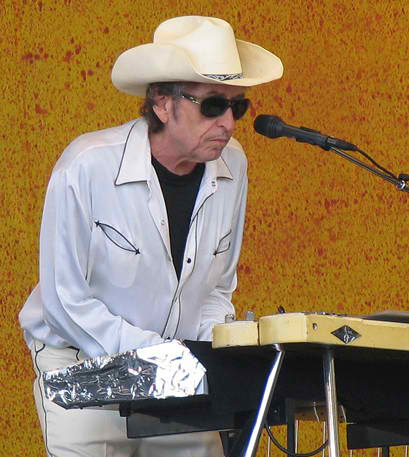 *McCormick, Neil (April 27, 2009) “Bob Dylan – live review” London: The Telegraph. Ive known Bob Dylan seance I was 16 years old. He’s different and he is a true gift once you get to know him. Hello Jack. It must be such a privilege to know someone as legendary as Dylan. I am constantly fascinated by artists who have divergent thought processes. Though I am technically an academic by profession, I would like to think that I have an artist’s soul hence the gravitational pull towards things strange, surreal and uncanny. Haha. =) Do share bits and pieces of what you know about Dylan though. How’d you meet? Very impressive living style of the 1960’s throughout the 80’s. Living in a very small town in California known for it singers and poets and famous writers of the 18th and 19th Century so come to the bands song writers to hide out and compose-As my Dad’s line of work was for the people of this small town you would be amazed who was on his client list. In my case was being at the right place at the right time-Even when we would go camping during the summer we run into filming of hit shows back then and hang around the daily shoot of Bonanza is a American western television series, or Little House or Lassie just to name a few. As in this town T.V, shows are made as Movies too now forgotten in the history of this town. Sold out that got turned into a T.V show after a few years filmed here and their in my town . That does sound very exciting. I am sure that the 60s throughout the 80s would be considered the Golden Age in films – no competition from network gaming, digital downloading, and piracy just to name a few. 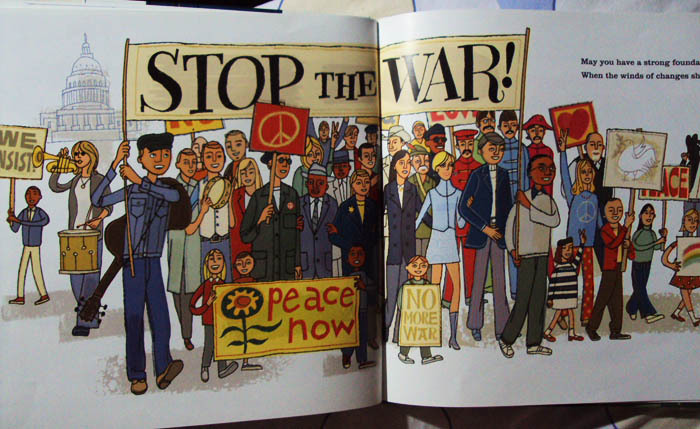 Add to that the general feel of the hippie, flower-power age, and the social unrest brought about by the war. Exciting times indeed. Do you have any news as to when your films would be shown? The only news Ive revived is what is on my web site; starts in 2011-The writer seemly last to get any info.But (Magical Woods)will be a great film.The people Ive meet on the web and talked about my work Gov. Schwarzenegger Dr. Hawass, Kelly Rippa etc… have asked too through the year.